I am fascinated by our ancestors’ ability to forage for wild foods. I get a thrill whenever I find wild onions, ramps, mushrooms, and even pawpaws. Today the raspberry bushes behind the garage drooped beneath the weight of the red and purple berries. My bucket filled in no time. My challenge was to bake the juicy berries into a wonderful confection with the limited ingredients on hand. 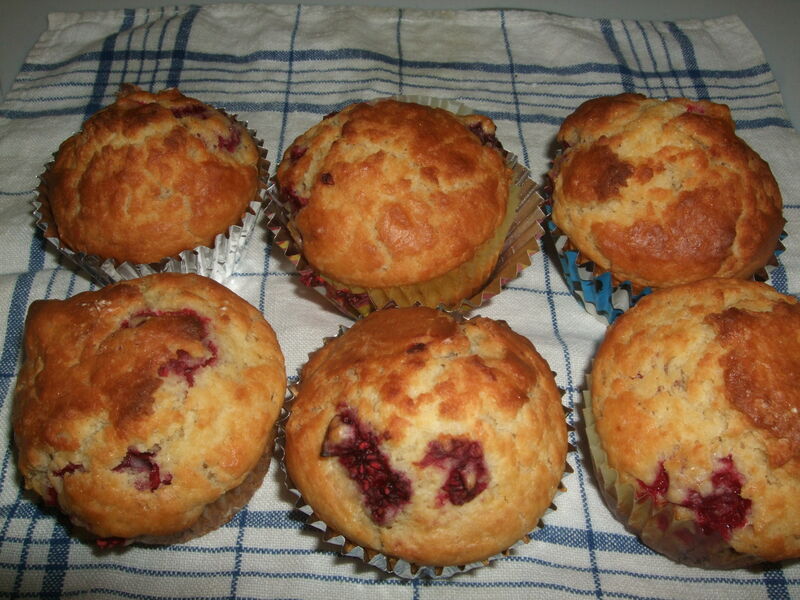 I went to my old standby – Muffins. They’re so easy and versatile. I’d never tried raspberry, however, and couldn’t find a recipe, so here’s my own concoction. My husband gave them a big thumbs up. In a separate bowl beat: 2 eggs. Add: 1/4 cup melted butter and 3/4 cup milk. Combine the liquid ingredients with the dry with a few quick stroke. Before dry ingredients are all moistened, fold 1 cup of raspberries gently into the mixture. The secret to light muffins is to not over stir. Fill muffin papers to the brim and bake 20-25 minutes at 400 degrees. Makes 10-12. With still more raspberries to use, I flipped through cookbook my quilting group compiled years ago. 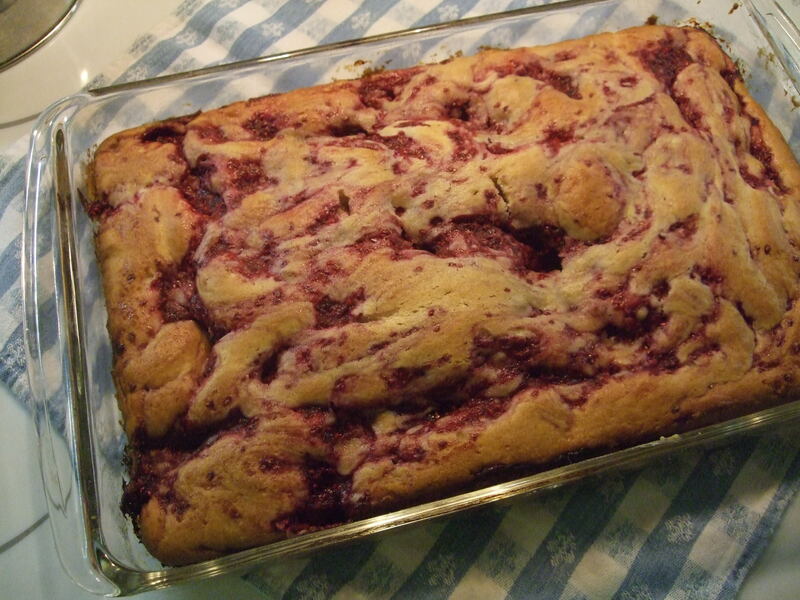 Marie Elzinga’s Cream Cheese and Raspberry Coffee Cake caught my eye. Hers called for raspberry preserves, but I improvised and the result was delicious. Beat together until fluffy: 1 (8 oz) cream cheese, softened, 1 cup sugar, and 1/2 cup butter, softened. Add: 2 eggs, 1/4 cup milk, 1/2 tsp. vanilla. Combine dry ingredients: 1 3/4 cup flour, 1 tsp. baking powder, 1/2 tsp baking soda, 1/4 tsp. salt. Add half the dry ingredients to the liquid and beat for 2 minutes. Add remaining dry ingredients and mix on low speed. Spread batter in a greased and floured 13 x 9 pan. Filling: Mash 1 cup of raspberries into 1/4 cup or less sugar. (Don’t use all the juice produced) Spoon the mash onto the batter in ten glops and swirl into the batter with a knife. Bake at 350 degrees for 35 minutes or until brown. Serve warm.